Rated at 9,000 to 11,000lbs. This new diesel hydrostatic drive family achieves its durability and low costs of ownership from its rugged designs and field proven components. With Komatsu’s hydrostatic drive system, standard wet disc brakes, and Closed-center Load Sensing hydraulic system (CLSS), the FH series achieves reduced costs of operation and reduced maintenance costs. 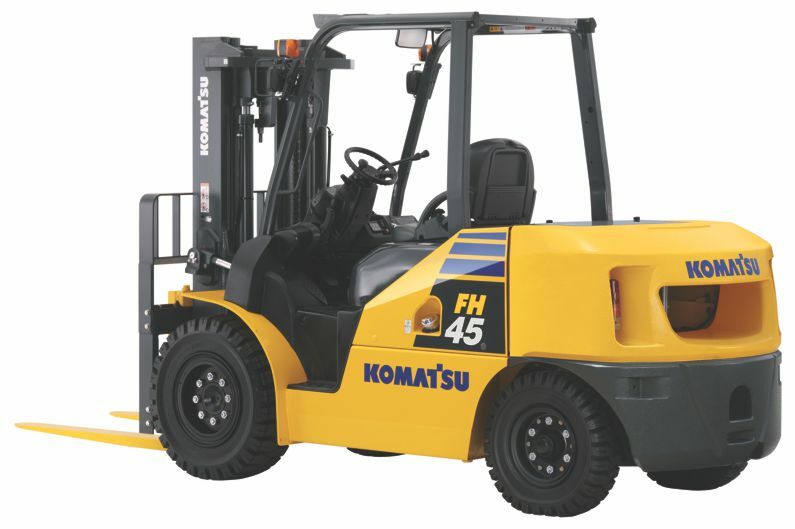 The FH series lowers your cost of operation in a variety of demanding, high-cycle operations. Also equipped with KOMTRAX—Komatsu’s exclusive information data management system. With many years of field-proven performance in Komatsu construction equipment, the FH’s sealed wet multi-disc brake system provides excellent braking performance in all operating conditions. The sealed system provides protection from dust, dirt and debris, thus providing higher reliability, fade and water resistance. Unlike a drum brake system, there is no need to replace the brake shoes resulting in lower maintenance costs and downtime. KOMTRAX, a standard feature on the FH series, is Komatsu’s remote equipment and fleet monitoring system. Leading-edge wireless technology and a secure, user-friendly web-based application provide critical information…anytime, anywhere. KOMTRAX tells you where your machines are, what they are doing, and how they are doing it providing total fleet management capabilities for improved fleet utilization, reduced downtime and lower owning and operating costs. Komatsu’s turbo-charged 4-cycle diesel engine is Interim Tier 4 and EU Stage A emissions certified, without sacrificing power or productivity. The engine is connected to the drive system hydraulically to transmit power to the drive system. This makes it possible for the FH series to make directional shifts smoothly without the need to release the accelerator pedal.